Our cotton blankets and throws are perfect for year-round use. We offer a variety of cotton to weave our blankets including normal cotton, ring-spun cotton, and premium cotton such as Supima and Egyptian. We also use eco-friendly fabric including IMO certified Organic cotton, Bamboo, Silk and Lyocell; all which can be 100% or blended with another fiber. 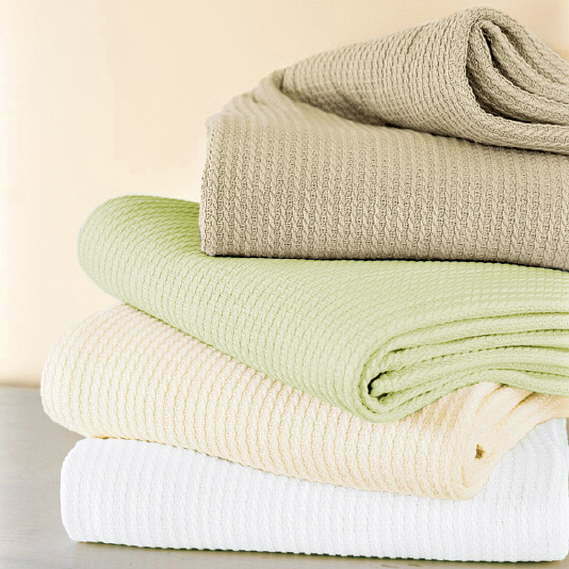 Our cotton blankets come in a variety of textures and weave patterns. Our luxurious plush and micro-mink, and faux fur blankets are made of 100% polyester and can be dyed in a solid color or print. Blanket and throws can also be embossed or quilted for a more decorative look. Our down blankets and throws are made with down proof, 100% cotton shells and filled with soft, fluffy down for ultimate comfort. We also offer down alternative filled blankets and throws in cotton, plush, or microfiber shells. We have a variety of stitching patterns which help minimize the shifting of down or down alternative fill.